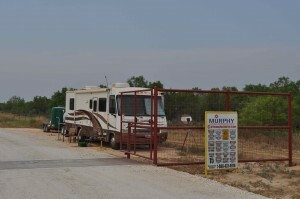 We got to our new gate this morning around 10:30 and willie the Gate Guard set up man got us all set up and going. 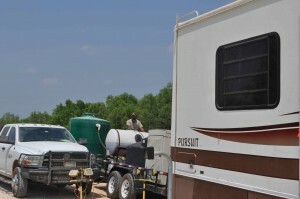 the day went rather slow until at around 1:30 when Stallion started delivering light carts then a mobilehome to serve as quarters for the Murphy oil men to reside in. Then more more stallion trucks with the water tanks etc for the house. At 2:15PM we met the two people that are going to be running the Frac team they said that they would be working out of here on another site for the next week or so and the frac on this well is scheduled to start on the 27th. At 8:52 PM we had two loads of frac pipes arrive then at 9:13 PM the boss for the frac pipe crew arrived and now they are in the process of trying to locate the frac tank. Someone on the phone told them it is possibly a mile down hwy 133 through another gate. So bear with me folks it seems as if I am going to have an interesting night.